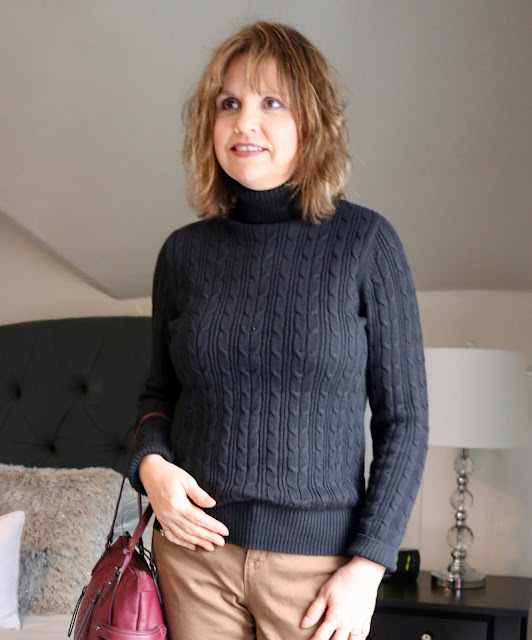 It is still cold and snowy in Wisconsin, so this is what I wore to a dentist appointment and an afternoon of shopping last week. Last Christmas JCPenney had a sale on their St. John Bay's Turtleneck Sweaters for only $14.99 so I bought two of them: one in black and one in white. The cable knit, the colors, and the cut were very classic and I knew I would get a lot of use out of them in the years to come. Because I spent most of the day running from a car to a building, I didn't wear anything else but the turtleneck underneath my coat: it served as a base for my entire outfit. My brown jeans are old. They are by Style & Co, sold at Macys. Wearing black and brown together used to be taboo, but now it's actually fashionable. I just love the look of brown and black together; especially with my coloring. For outerwear, I chose my faux leather bomber jacket with a fur collar, also from JCP (old). Because the sweater is so warm, a lighter jacket was all I needed for a thirty degree day. I added a bomber hat because it goes so well with my jacket. It is still so snowy and messy outside, I wore my new lace-up combat boots from Charlotte Russe. I really hope it warms up soon so I can share some spring outfits! I'm anxious to wear some different colors and some new dresses I bought! It might be in the fifties on Thursday...keeping my fingers crossed. This is a fantastic look Amy. I like the colour mix and you can never have enough roll neck jumpers! I hope you're weather is better than ours in London! Thanks Laurie. I don't think our weather is much better than yours. Spring is definitely slow in coming to Wisconsin. We still have snow on the ground and chilly temperatures. I like the black and brown color combo and the jacket finishes off the outfit so nicely. Great deal on the sweaters, I try to stay away from turtlenecks...I like the look and practicality of them but for some reason they just drive me crazy LOL. Thanks Elli, truth be told, turtlenecks drive me crazy too! But they are so warm, I like the look, and the convenience of not having to wear a scarf when the weather is brutal cold that I just deal with the aggravation. I like the turtleneck and the full look with the hat and coat. The funny thing is I got rid of most of my turtlenecks years ago. I've finally been adding some back in, because they work so well for the cold weather!! Love the jacket too, Amy!! That's funny, because I actually got rid of all my turtlenecks a few years ago too! Then last year I purchased a couple of Worthington turtlenecks and this year I bought this style. My old turtlenecks were on the "short" side, that's why I got rid of them. They are nice under-pieces for cold weather! This turtleneck is so pretty, Amy! Love this classic staple! It looks amazing with the jacket. Thanks Katrine! I wore the jacket all day (with the exception of the dentist office) so that was the complete look; not the turtleneck alone. Those cable knit sweaters are my go-to for work. They are always so cozy and comfy..and having a black one is a closet staple! Thanks Shauna! It definitely is a closet staple! That jacket is so edgy! I love the sherpa details! Thanks Ruth! The jacket is one of my favs, and hubby's too! You can't go wrong with a classic cable knit! Love this, lady! Thanks Ashley! You are always so encouraging! I love the neutral colors in your outfit! That jacket and hat look so good together! Such a classy outfit and talk about a fun hat! You look great! Cable neck turtle neck's are always great pieces to have, I really like the color combination of this outfit! I love your classic sweater on you and your faux leather shearing jacket is so stylish and looks cozy too! You look great!